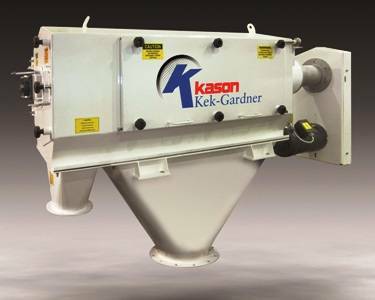 A new Kason Kek-Gardner high capacity centrifugal sifter Model K1350C removes oversize foreign matter and agglomerates from on-size material at rates up to 100 tonnes per hour on a continuous basis. It features an easy-to-clean cantilevered three-bearing shaft design with bearings at the motor end of the shaft and on the exterior of the discharge end cover, providing maximum support for heavy loads. When the end cover door is opened, the shaft cantilevers on a third in-board bearing, allowing the screen cylinder and helical paddle/feed screw assembly to slide freely from the shaft end for rapid, thorough wash down. An exclusive “forward and lift” access door on gas struts improves interior access for cleaning, inspection and maintenance. The sifter can be configured for gravity-fed applications, or dilute-phase positive- or negative-pressure in-line pneumatic systems. Screen cylinders are offered with Nylon monofilament, woven wire, perforated plate or wedgewire screen. Available in industrial and sanitary construction and with explosion-proof safety switches and motors when applicable, the centrifugal sifter is suitable for bulk food, chemical and mineral applications, including those involving frequent screen changes or material changeovers where cross-contamination must be prevented. As bulk solid material is gravity-fed into the feed inlet, a feed screw redirects it into the cylindrical sifting chamber. Rotating helical paddles within the chamber accelerate the material, continuously propelling it against and through apertures in the screen. Oversized particles are ejected through the end of the screen cylinder into a discharge spout. In addition to sifting of dry materials, the screener can reduce soft agglomerates and/or dewater moist solids or slurries.